Although Facebook has grown beyond its beginnings as a way to connect people with friends and family, those connections remain the primary reason people go to Facebook. Facebook users are split over whether they like having posts about news mixed in with other kinds of posts in their feed (52% enjoy it, 47% do not), but few are particularly bothered by news posts. When asked about things that people do on Facebook that might bother them, just 10% of Facebook users say it bothers them when friends or family post news stories. The only category less bothersome than posts about news stories is posting pictures of children or pets; just 7% say this bothers them. Additionally, the vast majority of people, 78%, who get news on the platform encounter news on Facebook mostly because they are on the site for other reasons. 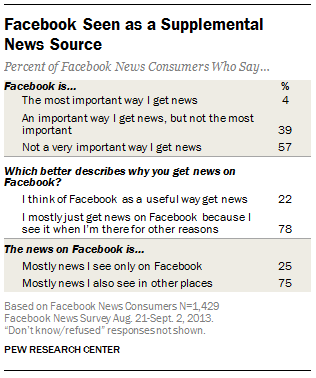 And news on Facebook is not seen as unique to the site; three-quarters, 75%, say that the news they see on Facebook is news they encounter in other places. 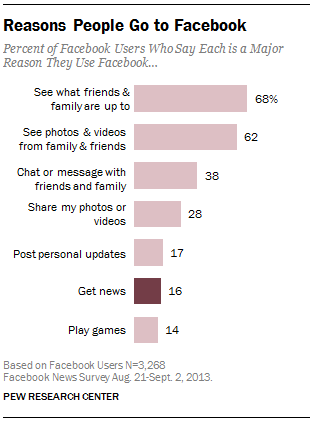 Facebook also tends to be of greater value in informing those who do not typically follow news all or most of the time. While 38% of Facebook news consumers who say they follow the news all or most of the time say Facebook is an important way they get news, the figure rises to 46% among those who say they follow news some of the time, and 48% among those who follow news less often. And, as a reflection of the incidental nature of news on Facebook, the more one is on the site, the more likely they are to get news there. About two-thirds (67%) of those who use Facebook for at least an hour a day get news there, compared with only 41% of those who spend less than an hour a day on the site. And more than half, 57%, say that Facebook is an important way they get news, versus 36% who spend less than an hour a day on Facebook. Similarly, about two-thirds (68%) of those who check Facebook throughout the day get news there, compared with just a third (32%) of those who check Facebook from time to time.